The Vitamix 5200 blender is an excellent choice for any type of kitchen. In our opinion it’s one of the most complete food blenders around and will do pretty much anything you ask of it! Pro Blending Power At Home! Blends and cooks your soup in less than 5 minutes. One of the best blenders for crushing ice. Makes instant healthy ice cream and sorbets. Breaks down whole foods for maximum nutritional value. 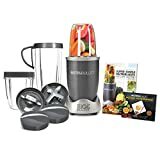 Sporting a new look and now coming in a choice of three colors, the Vitamix 5200 blender (known as the Total Nutrition Center in the UK and other counties) will look great when in use, and when sitting on the side in your kitchen. With a brand new, more powerful, energy efficient motor, it will perform your tasks effortlessly first time every time. 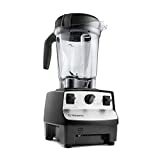 As always with this brand, the latest Vitamix blender comes with a long warranty should you need it, a cookbook, a manual and a great instructional DVD. The Vitamix retails at $400 to $500 and worth every penny. And lately I’ve seen certified Vitamix refurbished blenders on Amazon for under $300! If you are quick you might be able to still pick one up. The 5200 Blender replaces the Vitamix 5000. It’s packed full of new features including a new cooler running energy saving motor, coupled with variable speeds that will deal with any kind of blending you require. Packed full of features including a new cooler motor. Vitamix blenders have a laser crafted, single piece steel blade that allows you to blend or grind food quickly and effortlessly. And with soft touch buttons which complement it perfectly you can be sure of the quality. The new 64 oz. BPA-free Eastman Tritan copolyester jug incorporates a sound reduction technology, ergonomic grip handles and a non-drip spout. Perfect for those large cool drinks in summer, or hot delicious soups in winter… Yes, it will even cook your soup! The jug will also accommodate all of your ice cream making and other delights, and with the enclosed tamper, you can push your ingredients into the container, even as the blades are rotating. Laser crafted, one-piece stainless-steel blade assembly and BPA-free jug. It’s also really simple to keep your Vitamix blender clean. A bit of warm, soapy water, a quick wipe down and your machine is ready for use again. 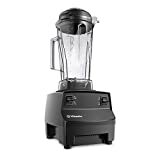 The Vitamix 5200 blender comes complete with an instructional DVD, a cookbook as well as a manual and long warranty should you need it. So if you want to try a new smoothie recipe, or if you are not sure on a particular detail you can be assured Vitamix will have thought of it and included it in the manuals or DVD. There is a choice of three different colors, red, white and black, each color will complement not only the Vitamix blender but your kitchen too. A choice of colors, red, white and black, includes instructional DVD and a cookbook. In the UK the Vitamix blender goes by the name of ‘Total Nutrition Center’ and that title certainly fits the bill here! With the ability to micronize raw, whole fruits and vegetables while still being suitable for home use, the 5200 can make fruits even more nutritious than if you were to simply eat them. Vitamins and minerals are locked into the seeds of many fruits by thick cellular walls. The vitamix blender will break these walls down for you. The Vitamix 5200 blender allows you to really get all the goodness out of fruits and vegetables, which are packed with vitamins and fibre. If your children are being difficult and won’t eat their veggies, you can blend some vegetables in with fruits for healthy smoothies and they won’t even taste the difference! Vegetables like carrots, cabbage, celery hearts, avocados and artichoke all work well as they don’t impart much flavour. Apple and cucumber are a great tasting mixture, just remember to remove the apple seeds, which are not that healthy in large quantities. A fruit and vegetable blend could even be the foundation of a nutritious yet tasty ice cream that your whole family can enjoy (more on how to do that below). The Vita Mix blender is wonderfully diverse when compared with other blender types, with power and design which allows it to blend on high setting for extended periods of time. When the blades begin to reach exceptional speeds, the friction created against certain fruits and vegetables can be enough to cook the ingredients. Whole fruits and vegetables can effortlessly be turned into a velvety soup which is both nutritious and great tasting. Ice creams and sorbets are a synch with the Vita Mix blender. Depending on the amount of time and friction you use the result will be a variety of different textures and temperatures. As a guide to this, the recipe book is an excellent resource which will allow you to get to know your machine using step by step instructions. However, trial and error is the best teacher as you’ll get better and better at creating tasty ice creams and sorbets. The ‘Dry Blade’ container is an excellent feature offered as an add on to the basic Vitamix blender package, it allows you to create your own fresh flours by grinding whole grains and beans. This is a much healthier alternative to store bought versions. Using this container, you can also create your own powdered sugars and bread crumbs for all your culinary needs. The price is high and will put some people off making the purchase, but in our opinion you do get what you pay for, and the Vitamix has the highest average consumer rating on Amazon. In truth it was difficult to find anything overly negative about the Vitamix blender. One minor problem could be it’s size, as with the jar on top the Vitamix 5200 is 52 cm tall. That might be difficult to slide underneath your cupboards in the kitchen. This can be annoying as the machine is quite large and bulky and ideally would be better underneath the cupboards. Another possible negative is the fact that you have to pay extra for a ‘dry’ container if you want to grind whole grains down in to flour. The Vitamix regular jar will be ok for lighter dry loads such as oats, or grinding sugar in to powder. But you will have to purchase a separate jar at around $100 to grind the harder whole grains like corn, rice and wheat. But then some might not want or need such capabilities, so why should they pay for it? I guess that for now it make sense for Vitamix to have it as an optional extra, thus keeping the initial purchase price down as low as they can. Vitamix 5200 blenders are high quality and very durable! 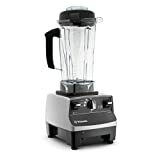 The 5200 is the latest Vita Mix Blender made specifically for use at home. As it’s a fairly new product it hasn’t received as many reviews and ratings as the older models below, but the initiall response shows us that the 5200 still meets the usual high quality Vitamix standards. 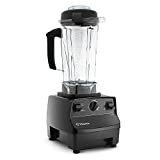 So far this blender has received more than 30 five star ratings on Amazon and still averages 4.5 stars overall from a total of 42 reviews, that’s a pretty good start! So far this blender has received a very credible 206 five star ratings on Amazon and averages 4.5 stars overall from a total of 247 reviews. It’s hard to get more than 200 five star ratings without being a quality product. Many users love it for its awesome power, convenience and great performance. And others say that the cookbook is a real bonus! This machine has not been around as long but has a very solid 4.5 five star ratings on Amazon and also averages 4.5 stars overall from a total of 54 reviews. Most owners on Amazon love the product and say that it’s a fabulous blender that works miracles and has lots of power. The Vitamix blender is one of the most complete blenders around and will do pretty much anything you ask of it. With the cool running, energy efficient motor and the large container, you can be assured that all your soups, sauces, smoothies, milkshakes and anything else you require your blender to do will turn out perfect every time. This blender is the last one you will ever purchase. It’s high quality and very durable… It chops, it grinds, it minces, it juices, and it will crush ice with smooth efficiency… It will even cook your blended soup! What else can we say? It is expensive, but once you buy it, you’re set for life… so save up the money for this machine! Having said that there is strong competition from Blendtec, so before you make that purchase you might want to check out our Blendtec vs Vitamix comparison, just to be sure you have a totally informed opinion.